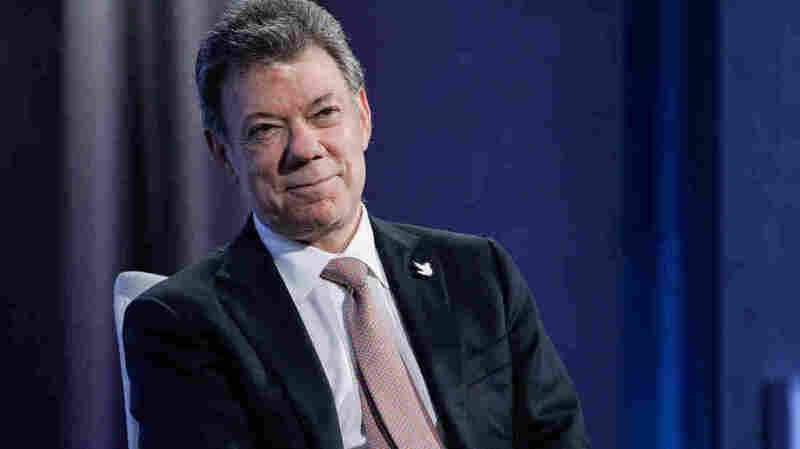 Colombian President Juan Manuel Santos Awarded Nobel Peace Prize : The Two-Way The Colombian president was cited for reaching a peace agreement with the FARC insurgency. Colombia's voters narrowly rejected the peace agreement in a binding referendum this week. Juan Manuel Santos, the president of Colombia, listens to a panel discussion during the 2015 Clinton Global Initiative's Annual Meeting in New York City on Sept. 28, 2015. Juan Manuel Santos, the president of Colombia, was awarded this year's Nobel Peace Prize for his "resolute efforts to bring the country's more than 50-year-long civil war to an end." The surprise announcement comes less than a week after Colombian voters delivered a shocking blow to the peace process, and the award notably excludes any leaders of the FARC guerilla group, the other side of the negotiating table. But the prize committee says the award "should also be seen as a tribute to the Colombian people who, despite great hardships and abuses, have not given up hope of a just peace, and to all the parties who have contributed to the peace process." The Colombian government and the FARC rebels spent years negotiating a peace deal to end a war that killed more than 220,000 people and displaced millions. On Sunday, the country's voters narrowly rejected the final agreement in a binding referendum. Voters felt the deal "was too lenient toward rebels who are accused of war crimes," NPR's Frank Langfitt reports. "I won't give up," Santos said after the referendum. "I'll continue search for peace until the last moment of my mandate." The Nobel Peace Prize committee said that despite that setback, the peace process in Colombia is not necessarily dead. "What the 'No' side rejected was not the desire for peace, but a specific peace agreement," the committee said in a press release, before praising Santos' calls for a "broad-based national dialogue" to move the peace process forward. As for why the award for a multi-party peace process went to a single individual, the chair of the Norwegian Nobel Committee, Kaci Kullmann Five, said that Santos initiated the peace process and that "he, as the leader of the government, went all in with a strong will to reach a result." The prize is "certain to be controversial and provocative," Frank reports. At the press conference, journalists asked Five whether awarding the prize to Santos might set back the peace process in Colombia, by offending the excluded FARC leaders, or be seen as disrespectful to Colombia's democracy. She said no, on both counts. Five said that it's not unusual for a peace prize to be disputed. "Our aim is to honor the work that has been done ... and to tell to the Colombian people that we encourage you to go on through all the parties that have participated in this process," she said. "I accept it not on my behalf but on behalf of all Colombians, especially the millions of victims of this conflict which we have suffered for more than 50 years. "It is for the victims and so that there not be a single new victim, not a single new casualty that we must reconcile and unite to culminate this process and begin to construct a stable and durable peace." Santos is the second Colombian Nobel Prize recipient; Gabriel Garcia Marquez won the Nobel Prize in Literature in 1982. This year there were 376 nominations for the peace prize, far and away the most ever. The names of the nominees are kept secret for 50 years.